Though we don’t always realize it, our environmental agenda is powerfully shaped by particular places. The landscapes we idealize, those that become iconic in our culture, suggest certain guiding values and priorities. In the United States, for the past century, we have been enamored of national parks, and they tell us that we need sublime wilderness in our lives, glorious scenery, charismatic megafauna. Travel to Yosemite, and you’re immediately seized with feelings of grandeur, expansion, uplift. But you’re also on vacation, removed from ordinary life and from problems like pollution and overconsumption. Our national parks are stunning, but they ultimately distract us from the need to remake our relationship to the natural world. What we would be wise to look to instead, in this era of superstorms and “hundred-year” floods, is the sort of iconic landscape that American culture celebrated in the era before national parks—the sort of place that evokes not infinite beauty but human limitations, and our intimate connection to the land. And such a place still exists, just two miles west of Harvard Square. Many residents of Massachusetts already know Mount Auburn Cemetery as a lovely place for a glimpse of history (the graves of Longfellow, Buckminster Fuller, and Isabella Stewart Gardner are especially popular), and as one of the best urban birding locations in the country. But the cemetery’s founders also intended it as an expression of the need for human beings to adapt to the places that we inhabit instead of reengineering them to meet our desires. Since 1831, Mount Auburn has been inviting Americans to reckon with the importance—even the satisfaction—of acknowledging limits. In the early 19th century, the rapid growth and industrialization of American cities had led to widespread worries about the costs of modernity, including crowding, disease, and pollution. A particular problem was grave-yards, which were starting to overflow with neglected corpses. 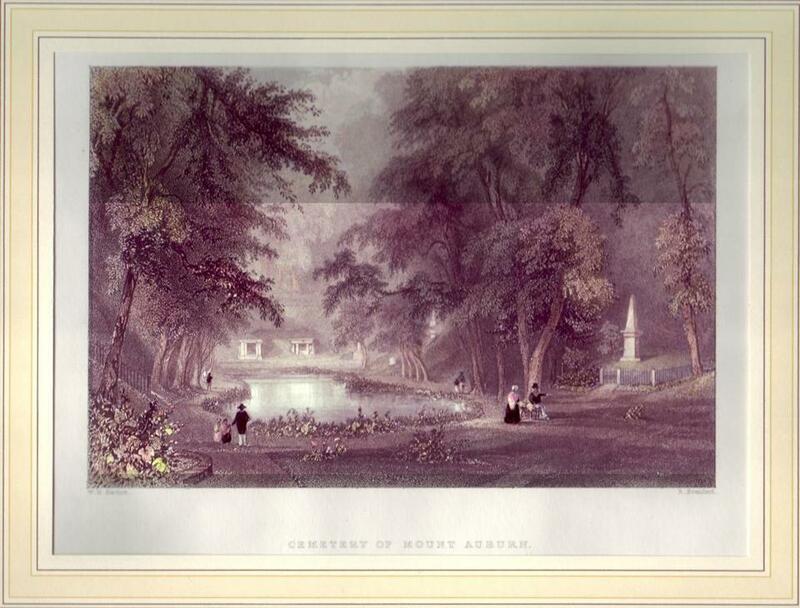 So when a few landscape gardening enthusiasts came together in the late 1820s to discuss the possibility of creating a new kind of cemetery near Boston, they were addressing not only the preferences of the proper Bostonians who might like to be buried there, but also broader environmental and public-health concerns. It was Bigelow, though, who provided a vision of the cemetery’s fundamental meaning as a place of broad, public commitment to commonality and to the kind of humble ecology that ultimately sustains life. “The progress of all organized beings,” Bigelow said, “is toward decay.” Yet he did not embrace a gloomy fatalism, for he believed that decay was the key to life: “The plant which springs from the earth, after attaining its growth and perpetuating its species, falls to the ground, undergoes decomposition, and contributes its remains to the nourishment of plants around it.” So, too, with “the myriads of animals,” including human beings, who must step aside so that others might live and grow. Mount Auburn was an immediate success, becoming as popular a tourist destination as Niagara Falls and George Washington’s estate at Mount Vernon. It nourished a commodious kind of public space, in the spirit of its Unitarian founders, who welcomed all religions and ethnicities and made plots available at very low rates (you could even earn a plot with a few hours of labor). All Americans, exclaimed Story at the consecration, should have the opportunity to “dwell in the bosom of their mother Earth! The rich and the poor, the gay and the wretched, the favorites of thousands and the forsaken of the world.” Families of all classes huddled at graves to express their grief while lovers strolled through shady copses, and factory workers soaked up the “deep and quiet beauty”—as one woman from the Lowell mills put it—that made so many of them nostalgic for the rural lives they had abandoned in the quest for a good urban job. And the cemetery’s influence soon percolated outward. The designers who would eventually become America’s first city planners, such as Frederick Law Olmsted, flocked to Mount Auburn to lose themselves in its “mazy labyrinth,” as one guidebook said—to wander along pathways that were “adapted to the natural inequalities of the surface” rather than imposed on the topography as a mark of conquest. Olmsted, who got to know Mount Auburn as a young man in the 1830s and ’40s and went on to design New York’s Central Park in the 1850s, pointed out that this kind of landscape was clearly intended as the “antithesis” of the classic urban grid. After Mount Auburn, every city in the nation had to have its garden-style cemetery: The basic design was copied in Brooklyn, Baltimore, Cincinnati, St. Louis, Atlanta, and many other urban centers. So far, these 19th-century green spaces have withstood the pressures of modernity. They have changed, of course—Mount Auburn’s vegetable gardens were abandoned after just a few years. But burying loved ones on hillsides turns out to be a particularly good way of preserving hillsides. Today, thanks to the farsightedness of Mount Auburn’s designers, we can still walk through these rolling landscapes and recapture the experience of our ancestors. Mount Auburn is not as impressive as Yosemite, but it is much more immediate, especially in its blending of nature’s forces and human arts. Stroll along its pathways, and you’ll probably find the experience simultaneously chastening and bolstering: Having been cared for by generation after generation of Bostonians, the cemetery is now woven into daily life, with all its vicissitudes. You may feel the pain of loss, but it will be mingled with at least a hint of consolation, because it’s a loss that is spread through the landscape—a shared loss, the kind we’ve all experienced. And a sense of commonality may be the best grounds we have, these days, for hope and concerted action. Aaron Sachs grew up in Newton and teaches history and American Studies at Cornell University. He is the author of “Arcadian America: The Death and Life of an Environmental Tradition,” from which this article is adapted.